Conker is growing pansies and primroses. My back garden. April 2009. Ahh, Conker, such a wonderful helper!! And I just love the pansies! What a neat combo! Truffle the puppy has pulled out some of Conker's hair. Lol. Lovely photo TT , we saw a pup like yours visiting our local GC.He was only 11 weeks old,couldn't believe how tiny he was.A black coat mostly with tan and white paws-reminded me of conker. He was helping his owner choose plant pots !!! 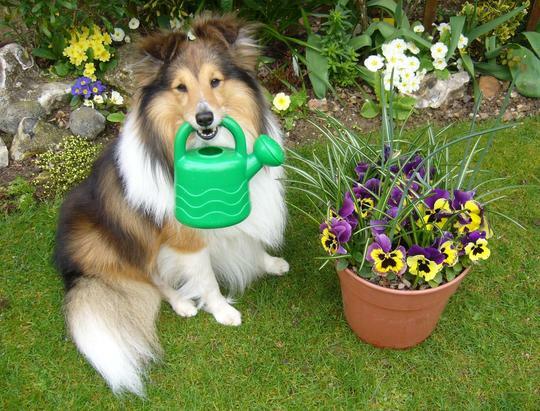 I bet the Sheltie puppy made good choices with the plant pots.Lol. I think Conker is a star. Such a wonderful companion and friend. Conker you are a clever boy , I love your pot of pansys they are so pretty , you are looking after them very well ..
Conker says he has started teaching Truffle a few gardening skills. Truffle is just about to start losing his puppy teeth, so not learning a lot right now. Lol. What a beautiful boy. I can feel that soft, thick and shiny coat from here. Awww...love him. He looks so proud. Do you think he could come over here and help me water all the plants in the greenhouse at work???? Conker is ready to help out in everyone's gardens. Conker could come to your work with you at the Garden Centre. He'll water the plants, then load customers' items into their cars, and bring you skin cream for your scratched hands ! He has a lovely coat TT - beautiful colours. I like your rockery in the background too. Conker has worked hard on his gardening this spring. He is teaching Truffle. Lol. Truffle is doing his best. Lol. Conker has lots of his own garden tools. Lol. You are getting to know my little family very well. ... they add extra taste to his salad. Lol. Boyfriend for your lovely girls. Lol. I would, but I'm afraid it would be too hard on Chummy..And Scrunchion might just scare him to death! But he is sooo sweet, like a little Chummy.. But he is surely a distant cousin of Chummy ? Lol. maybe Conker could water your flowers when you go on holiday Lol. Lovely photo TT, has he got any spare time? Has he put on his summer coat? Conker would be happy to help all GoY members with their gardens. Typical Sheltie ~ he lives only to please everyone.... Lol. I hope he's going to grow a bit more coat for the summer time. Yes you have to be sensible...he...he....last year we had no Pusscats...now we have 3! Must be totally mad...but absolutely adore them, and Finn of course!! Would you like Conker to help you with your garden ? Lol. That's good to know you like this pic. Truffle likes to eat pansies. Lol. Goodness!! Conker's coat seems such soft, and he is a beauty!! Well done for the pansies Conker! Truffle has just lost his first puppy tooth this morning .. He gave a little squeal and then I think he swallowed it..... :o(. One less tooth to chew the pansies... Lol. It will come out somehow... lol!!! Carolina, my daughter, is amazed about the looks of Conkers, she read everything wrote here about his breed. Conkers really looks like "Mutley" the collie her boyfriend lost last year. Conker says a special hello to you. .... I shall be looking out for Truffle's tooth. Lol. thats brill aswell, put that to favourites. It's just a pity that he can't get very many litres of rain water in that little can. LOL. well done for watering the Pansies conker your very clever aswell as beautiful. If you do that watering well, Conker, you could get the job permanently!! It's raining right now, so Conker has the day off. Lol. My heart turns to mush every time I see a picture of Conker. As I work my way through this thread, I think the rest of GoY feel the same. From Russia with love, Lol. He thinks the tassels from JR are a special delicacy. Lol. Hi TT I expect you have to keep Truffles on a short lead when you visit other peoples gardens, or has he already been banned from your friends gardens ? I'm not too good at English but I'll give it a go. Lovely shot of Conker and his pansies...gone to my favourites!! Thanks for visiting Conker the Sheltie. He's a lovely looking dog! I love these dogs although his long coat must give you a lot of work to keep clean. Conker would enjoy watering all your container plants. As you say, would take a long time with that small can ! Conker the Sheltie keeps clean naturally. He's never needed a bath, and Shelties lick their feet clean like a cat. Truffle the Terrier puppy is the one with the muddy paws. Lol. Conker keeps clean naturally? I like him more and more as time goes on. Aside to Hameryllis. LOL, we both got a chuckle out of your Russian. It must be working, he was in his own yard this morning. I was sorry to see him tied, even though he is a pest...he's so happy when he's cruising the neighborhood. Conker is a very clever boy. Does he help you to dig the flowerbeds too? That's a totally lovely photograph, lol. Thank you Darling, I hope you had a Happy Easter too! Conker and Truffle have been busy in the garden again this week. That's a picture to melt your heart! Thanks, Janie, and welcome to GoY. aw lovely all my doggies do is wee on my flowers and lawn, i am so jealous! Have you see my dog run photo, uploaded to GoY recently ? TT, Every time I look at this photo I laugh...I just can't help it. It kills me! It's bringing tears to my eyes...I get like that over a good laugh! Such a great dog and a lovely photo! Yes, Conker is very special. I'm sure Max would become a very efficient and eager garden helper. Lol. It's never too late to comment on any GoY photos. Really good dogs, it is very cute! Love this photo TT - I wish I could train our teenage son to do the same thing. We've just spent a week away and most of them are now dead! Crazy weather ! Did you see my pic of the big hail stones ? :o(. A pity about your dead plants ! Maybe Conker could visit you and help with your garden... He's good at raking, sweeping, mowing and tidying up the flower pots.... Lol. And I bet he doesn't walk around with his MP3 attached to his ears all the time either...Lol! 'Britains Got Talent' in his sight then ...Lol! Hi Pip...How are you ? Gorgeous photo..I've had 3 of these dogs over the years but now into the poodle x but the shelties are certainly amazing dogs...soooo intelligent. Does he do weeding? If so send him my way...! Stunning dog - beautiful - going on my favs. TT - Im getting so I have to have a weekly fix of Conkers Cute Pics! He is just too gorgeous for words! Is the weather warming up ?